I’m sure you already know that Catrice has a new and totally awesome line of polishes. They have put a lot of trendy shades like mint and taupe shades in their new line. 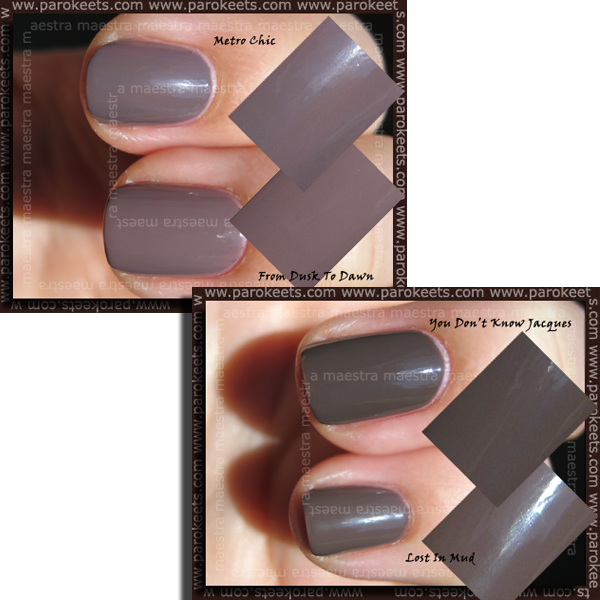 Today I’d like to show you a comparison between two of the Catrice taupe shades and two of the probably most wanted taupe shades ever. As you can see there are no dupes here, but some close relatives. Metro Chic and From Dusk To Dawn are very close, but not dupes. Metro Chic is a little bit more grey, while From Dusk To Dawn is a bit more on the brown side. Lost In Mud is a bit lighter than You Don’t Know Jacques and maybe more grey, but not by much. Catrice Ultimate Nail Lacquers are really amazing. They have some great colors. The brush is flat but not wide, which is great. The application is fine. A bit on the thick side but nothing to be worried about. All were applied in two coats in the pictures above. aaaa, From Dusk to Dawn, WANT! pa zakaj tega ni pri nas, no?! a se jih vsaj kje na netu dobi?